The Securities and Exchange Commission’s comprehensive 2010 reforms for money market funds are a proven success. As ICI research has shown, the reforms strengthened the funds and enhanced financial stability. Unfortunately, this success continues to be overlooked or ignored by regulators and academics who persist in raising alarm that money market funds are prone to destabilizing runs. The IMF’s analysis, however, displays a surprising lack of understanding of the laws governing, and institutional details surrounding, money market funds. 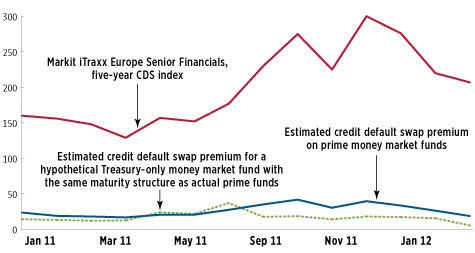 The IMF’s analysis does not once mention the SEC’s 2010 reforms to money market funds. The IMF’s analysis invites the reader to assume that money market funds use leverage (they do not) and that they can boost their yields by adding credit risk as desired (in fact, money market fund credit risks are highly constrained by SEC rules). The IMF suggests that money market funds engage in securities lending (they don’t). Money market funds do engage in repurchase agreements to invest in highly liquid securities that are overcollateralized by Treasury and agency securities. Contrary to the IMF’s analysis, it is extremely unlikely that U.S. banks could face a liquidity crisis caused solely by a run on money market funds. For one, lending by money market funds to U.S. banks is a miniscule part of overall bank liabilities. Also, U.S. banks can borrow from the Federal Reserve if they need liquidity (unlike Bear Stearns and Lehman Brothers during the financial crisis). In this blog post, we fill in gaps in the IMF analysis and discuss how the application of bank-like prudential reforms to money market funds could increase risks to financial stability—just the opposite of the IMF’s claims. In 2010, the SEC undertook sweeping reforms of money market funds. These reforms reduced risks and the potential that a fund might “break the dollar.” How so? One new provision is that money market funds are now required to hold substantial amounts of liquid assets to meet redemptions. Taxable funds must hold at least 30 percent of assets in securities that are liquid within a week, and at least 10 percent of assets in daily liquidity. Since those requirements were adopted, money market funds have consistently maintained liquidity well in excess of the minimums; prime money market funds held more than $600 billion in weekly liquid assets during the summer of 2011 (see chart below). As we discussed in “Money Market Mutual Funds, Risk, and Financial Stability in the Wake of the 2010 Reforms,” these 2010 money market fund reforms allowed prime money market funds to easily meet redemptions associated with the eurozone debt crisis and 2011 debt ceiling debate, and to adjust their portfolios away from European banks most affected by the eurozone debt crisis. 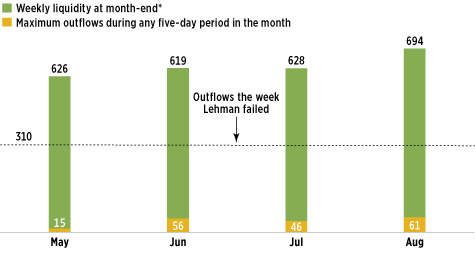 As the figure below shows, the level of weekly liquidity held by prime money market funds is more than double the outflows seen during the tumultuous week of September 15, 2008, when Lehman Brothers failed. *Weekly liquid assets include securities with a remaining maturity of five business days, Treasury securities, and agency securities with a remaining maturity of 60 days or less. Another reform the SEC enacted in 2010 was to reduce from 90 days to 60 days the maximum weighted average portfolio maturity (WAM) a money market fund can maintain. This change significantly reduced interest rate risk and the likelihood that any money market fund would break the buck. 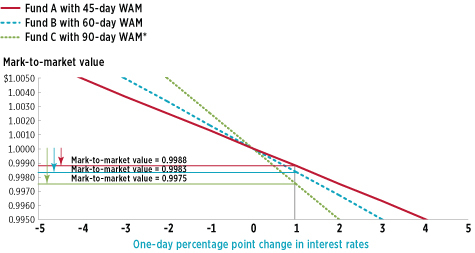 As the chart below shows, it would take an instantaneous rise in interest rates of more than 300 basis points to cause a money market fund with a 60 day WAM to break the buck or to move its mark-to-market value below $0.9950. For a money market fund with a WAM of 45 days, rates would have to increase by 400 basis points in one day for the fund to break the buck. *No longer permitted under Rule 2a-7. Note: Figure indicates the resulting mark-to-market value for a given change in interest rates. The initial mark-to-market value is $1.0000. So just how stringent are the SEC’s 2010 reforms of money market funds? Answer: very. In our recent paper, we analyzed how much credit risk prime money market funds took during the summer of 2011 compared to a money market fund that invested only in Treasuries. Using credit default swaps and adjusting for the short maturity of money market fund assets, we calculated an implied annual cost of insuring against default for the average holdings of prime money market funds and a Treasury only money market fund with the same maturity structure. We found that prime money market funds were not much riskier than Treasury-only money market funds based on this analysis (see chart below). In yet another misstatement, the IMF suggests that the assets of money market funds “are already shrinking in the low interest rate environment.” In fact, despite low interest rates, investors remain committed to using money market funds, and money market fund assets have been relatively stable over the past two years, ranging from $2.5 to $2.7 trillion in the United States. In our view, the biggest risk to money market fund assets in the United States and Europe is the desire by some regulators to impose bank-like prudential regulations on money market funds. These efforts could lead to a real contraction in the money market fund industry, thus reducing transparency and concentrating systemic risk in large banks or less regulated cash alternatives. Sean Collins is the Senior Director of ICI’s Financial Industry and Analysis and Chris Plantier is an ICI Senior Economist.